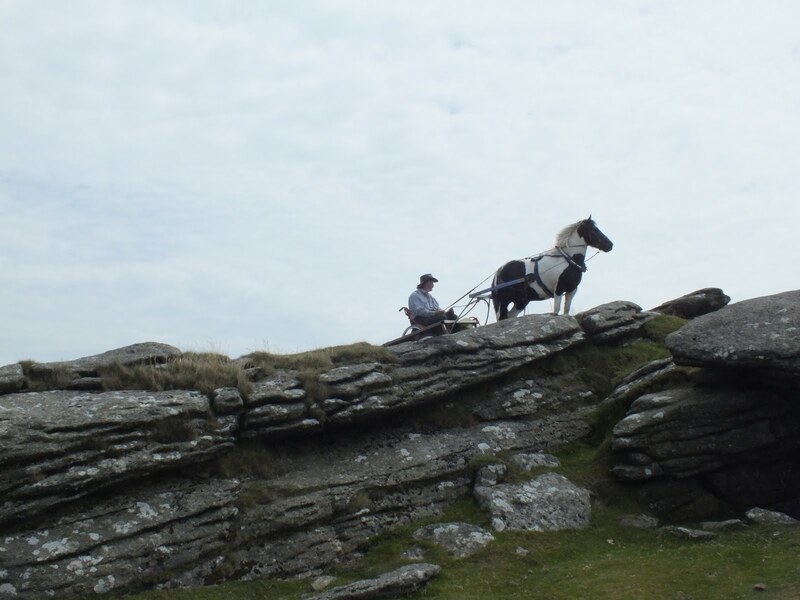 The iBex is a totally modern, pony drawn vehicle, designed to be enjoyed by anyone, in safety, regardless of previous experience with horses, or degree of mobility. It has the unique iBex Saddlechariot instant release system. This video shows two first time drivers and one dog activating the instant release system. The iBex is designed to be driven solo and can be driven seated or from a wheelchair. Me being stupid pushing the iBex to see what can go wrong. Lesson, must push harder. No initial assessment of the user is necessary. First time on the beach, first time in the sea. The safety of the iBex is integral to the vehicle itself. No assumptions as to the safety or otherwise of the horse are necessary. The most important element of the iBex system is the freedom it gives to beginners, regardless of their mobility status. Beaches, fields, riverbanks, woodland tracks, mountain and moorland are accessible by muscle power. The easy way to find out if they like trotting. Watch the grin. Too many activities require an initial assessment. How mobile are you, what do you weigh, what mental health issues do you have? The iBex requires none of these. 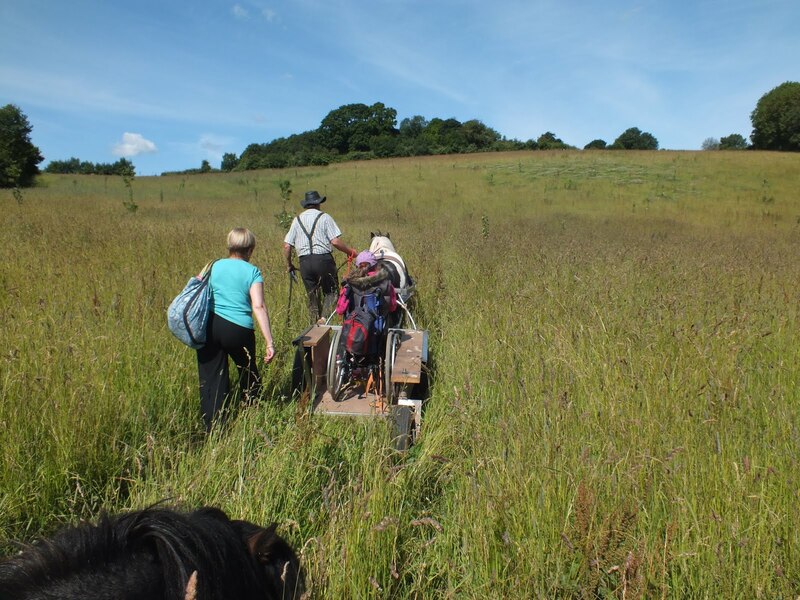 If you can get to the iBex, walking or in a wheelchair, the Bex can take you where you want to go. Nothing else matters. If you get scared, or the horse gets scared or something relevant to your specific condition occurs, you or the helper will pull the release cord. But if everything works, you are moving around cross country, propelled by muscle power that is controlled by you. You can go on the beach, or across a field. As you progress and gain experience, the possibilities are endless. Market garden agricultural work can be done, recycling can be collected, leaves swept etc. You can cross Dartmoor, blast along the beach, whatever. As your experience and skills increase, and as you can demonstrate those skills, your level of independence increases, but everyone starts at the same level. As a beginner, someone will walk with the pony, someone with the vehicle. That is inclusive means. No assessment is needed and all people start level. Where you go is up to you. The iBex is a horse drawn vehicle. The instinctive behaviour of a horse when threatened is to run. They don’t run TO safety, but AWAY from danger. Their instinct is to run as fast as possible away from threats. As a prey species that evolved on open plains, away from danger is all they need to know. Open space and safety is all around them. Any horse with a vehicle attached is automatically more stressed because it is trapped. The vehicle is not seen as safety. As speed increases the vehicle starts to bounce around and the occupants may scream. This increases the stress, and consequently the speed. An overturned vehicle frequently panics the animal totally removing any sense of direction. In battle horses have had their jaws blown off, and continue running. Therefore no bit, however severe is going to slow them down. Brakes are useless. Horses pull ploughs through the ground, brakes on the wheels sliding over the ground make minimal difference. To the horse, safety is open space and the freedom to move in any direction. 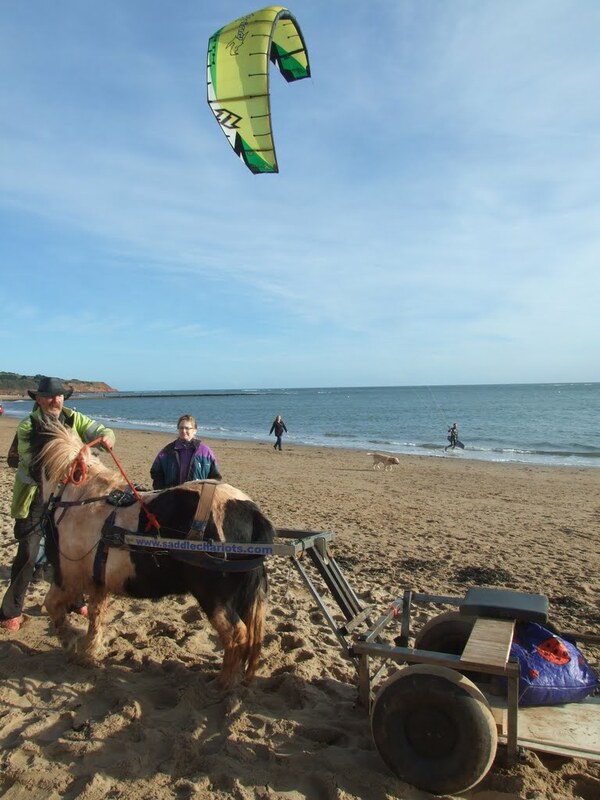 The iBex uses the Saddlechariot instant release system which allows the user and any staff members present, to release the horse instantly by pulling a rope, or a lever, or by radio remote control. The horse can run away from anything it may see as a threat, and stop when it reaches any open space where it can clearly see there are no threats. In a field, the horse will run away from any people, machinery, etc until it is surrounded by grass. Then it will stop and when it has calmed down, will eat the grass. The iBex will sit where it is because pulling the instant release applies the brakes. The user will be safe. The training for the user and for the staff is simple. “If you are worried, pull the release cord.” No horse knowledge is assumed or necessary. If the horse does something unusual, or speeds up, or changes direction, or the user is scared, or nervous or unhappy, or if any external threat or distraction appears, like the stables catching fire, jet fighters approaching or someone shooting a pheasant nearby, pulling the rope means the horse is free to run to safety and the user will be sitting comfortably. Another novice getting a first experience driving. Horse drawn vehicles are dangerous. 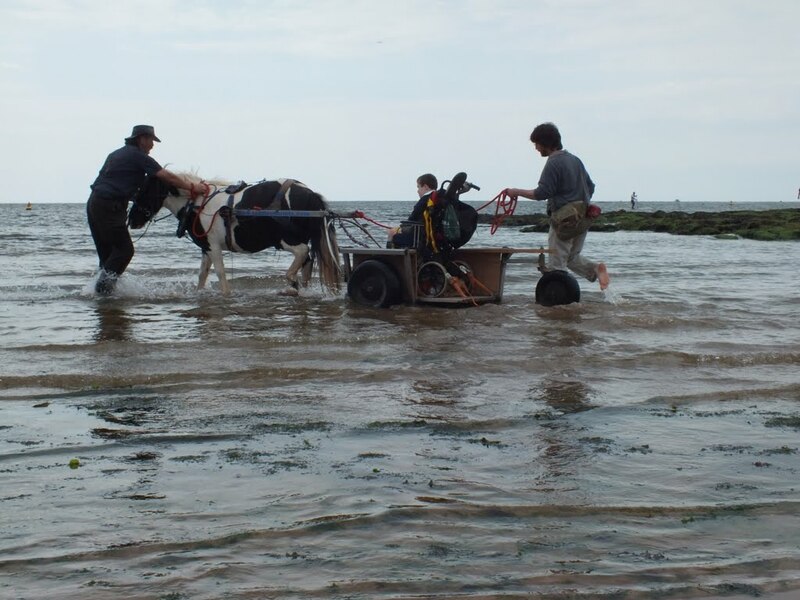 Detaching the horse turns a horse drawn vehicle into a garden seat. Garden seats are inherently safe. All the other iBex safety systems are secondrary. The instant release system is the factor that makes the system safe. The other factors mean that the iBex can be used with any manual wheelchair, and most powered wheelchairs. It can be used safely at speed across rough terrain or whatever. Without the instant release system, it becomes a horse drawn vehicle and consequently, dangerous. 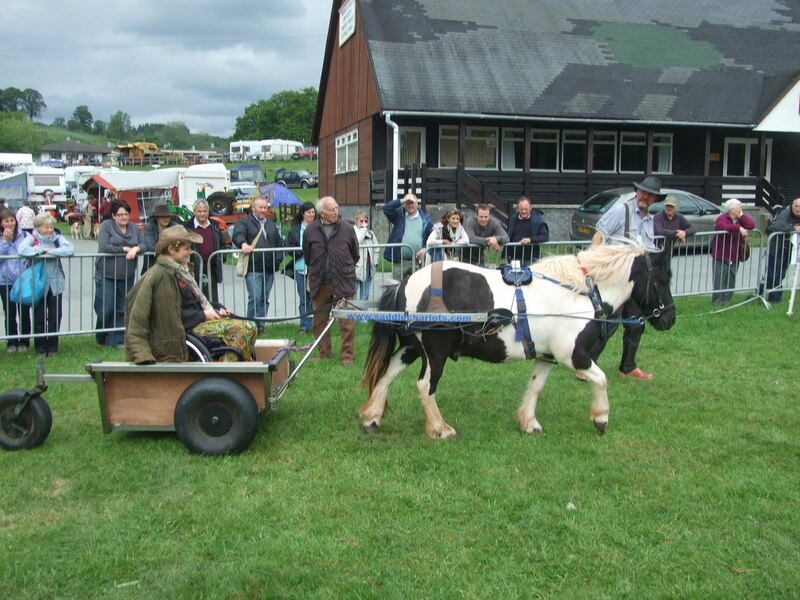 Releasing the horse is the only effective safety system as it turns a horse drawn vehicle into a garden seat. The horse is the major risk in a horse drawn vehicle. Releasing the horse means the iBex is no longer a horse drawn vehicle and the horse is just an animal in a field. The other major sources of risk are location and personnel, human and animal. Good location except for kites. A loose horse in a field is normal. A field is where horses are expected to be. If the location of the iBex activity is a field, checked beforehand as suitable for keeping horses, then releasing the horse from the iBex means you now have a loose horse in a field considered suitable for horses. A stationary iBex in a field is safe. As the participants, human and animal gain experience, other locations can be tried, but as a starting point, and for first time, unassessed users, a field is safe. Anyone in a responsible postion working with the iBex must understand that if they are worried, they should pull the release cord. If they only understand this, the activity is safe. 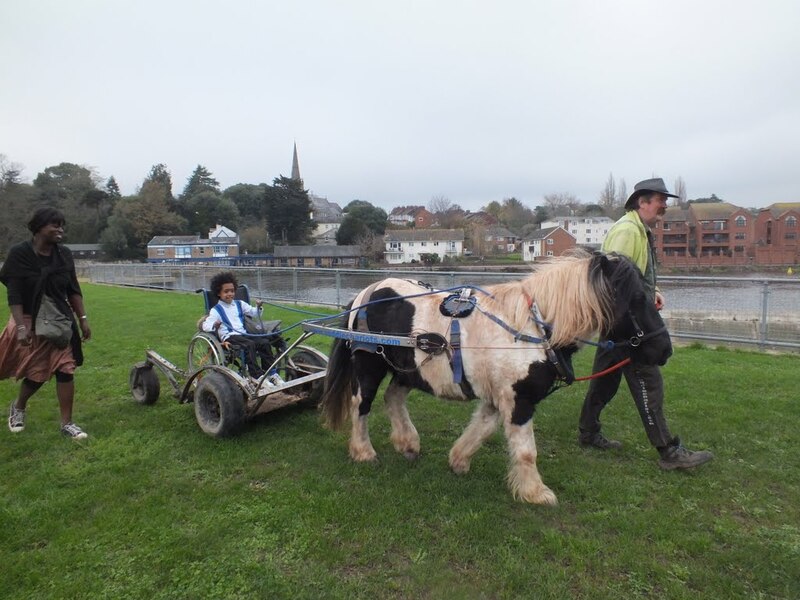 With experience and training this basic concept can open up a huge range of activities, and all terrain access for those with mobility problems and those without. But the essence is that at any stage, they can revert to a safe status. This cannot be over emphasised. Any animal can be put in the iBex with a novice disabled driver in safety. The result will be a lot of pulling the instant release cord and not much fun for the user, but it will be safe. Pointless and stupid and unproductive, but safe. The iBex was designed on the basis that someone might shoot my pony up the backside with an air rifle while someone was in a wheelchair strapped onto the iBex. This is unlikely but definitely possible. I know of no training system that will stop the pony from running away under these circumstances. Since I can do nothing to control the pony, I designed the iBex to cope with the scenario. This is why I say that training the pony is not part of the safety sytem. However, for any practical project, training the pony is vital. The better it is trained, the safer it is and the more fun everyone will have, pony included. Sirona and DPTC are keen on training with kindness which is by far the best way. The iBex is safe with bad training, but unproductive. With good training it is safe and productive. This video shows that Obama is pretty good about most things, just not so good about kicking mud into my face. I will now discuss all the other factors that make the iBex safer, and consequently more fun, as it can go to more exciting places at more exciting speeds. The vehicle is lightweight. Lightweight is great if the vehicle rolls over on top of you or drives over you. The iBex currently weighs around 50kg. The iBex is a three wheeler with two front wheels and an offset fully castoring rear wheel. Three wheels are inherently stable if the centre of gravity of the vehicle is inside the triangle formed by the contact points of the three wheels. Think milking stools. Four wheelers are permanently flipping between one stable three wheel configuartion and another and suspension is necessary just to stop the feeling of instability. The iBex feels stable.This feeling of stability is very important. A confident user relaxes the staff and the horse. But the iBex doesn’t just feel stable. It is stable. I drive it across Dartmoor and through woodland tracks and around fields attempting to flip it over. I haven’t managed yet. When I do, we will know just how stupid you have to be to flip it. The offset trailing third wheel allows easy wheelchair access from the rear. The whole vehicle tilts so the floor becomes its own loading ramp. When the wheelchair is on the floor, the back end is raised and the rear wheel returns to its normal position. 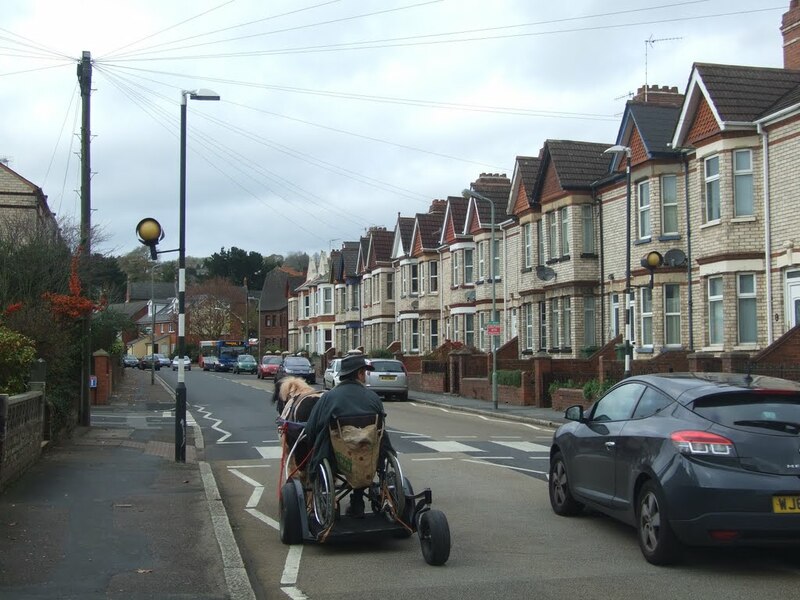 Alternatively the wheelchair can be loaded by tipping the front and lifting on. I tend to do this because I am not loading wheelchairs all day, and I don’t have to comply with manual handling procedures. The ramp system complies with manual handling best practice. The wheelchair is loaded on to the iBex before the vehicle is attached to the animal when working with new iBex users. This separates the stress of being loaded from the stress of being close to the animal for the first time. The Wheelchair fixing system uses tie down straps at four points. Any one strap can fail without danger. I have found no other system that fits every wheelchair. So, although fiddly, I will stick with it till a better solution comes up. If I was working with only one type of wheelchair, life would be simple. Ultra tough Pneumatic wheel tyre system. 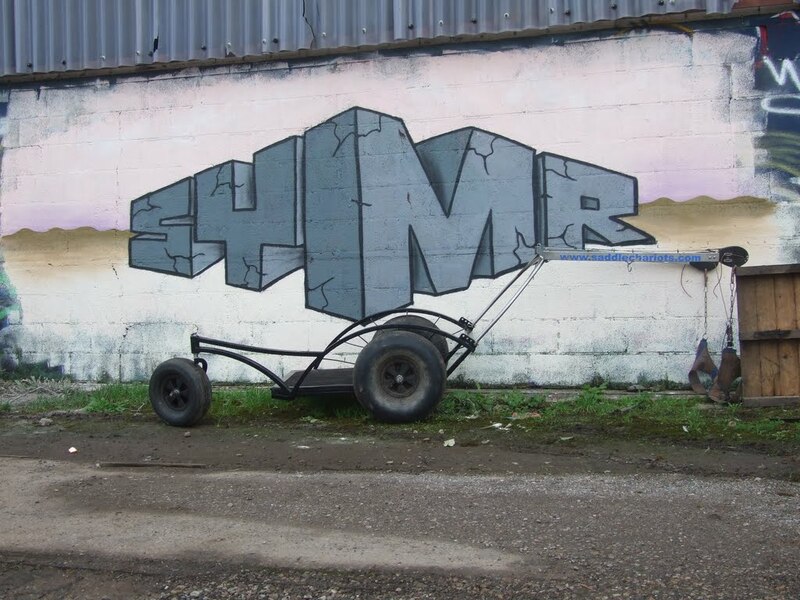 The iBex wheels and tyres are kite buggy wheels and tyres. Kite buggies go at insane speeds, drive frequently with one wheel in the air and the other two at stupid angles, and not infrequently get seriously airborne and drop out of the sky from 20 feet plus. I am not that stupid and don’t expect the iBex to do the things kite buggies accept as normal. Therefore I don’t worry about the wheels and tyres. Madder men than I have tested them. And I have done 500 plus miles on the current set of tyres without problems. Pneumatic tyres are safer and less effort for the animal, safer and more comfortable for the user. They do much less damage to the ground. I never use solid tyres. I do not use spoked wheels. Spoked wheels act like big blunt scissors on the limbs of children and animals and adults. 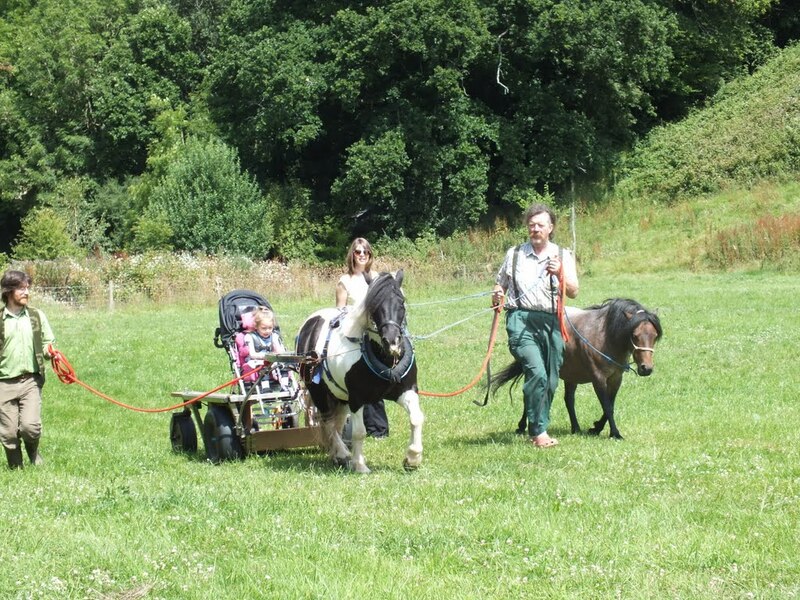 I build horse drawn vehicles to be safe round children and animals and even adults. Spoked wheels are dangerous. Climbing Rowtor with the iBex prototype. Brakes only work if the animal isn’t pulling. An animal that can pull a plough through the ground isn’t going to notice a wheel sliding over the top. The brakes are important if the animal is released on hilly ground as they keep it still and safe. They help the animal when going down steep slopes. An animal can only exert about one fifth of the braking force, as opposed to pulling force. The horse stops the vehicle with a strap that goes above and behind the knees. Try pushing back with a strap above and behind your knees and compare the force with what you can pull with a shoulder harness. The iBex has two braking systems. 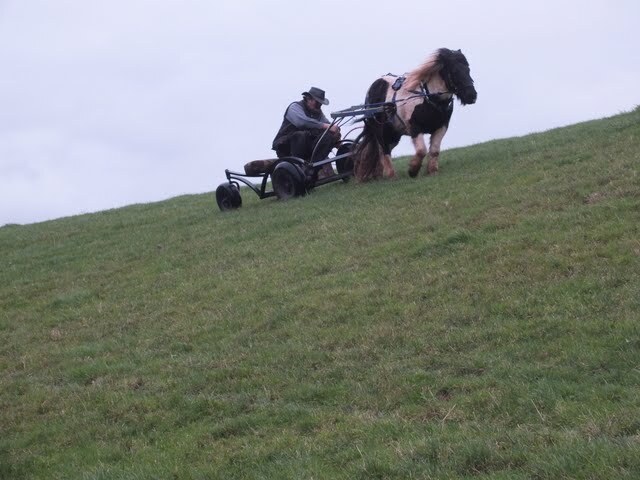 An automatic brake applied when the animal is released, and an over run brake to apply the brakes automatically to aid the horse going down steep hills. I don’t provide a brake lever for the user as incorrect use of the brakes can damage stability. Neither automatic system can operate them incorrectly. The vehicle is curved and designed so if it does hit someone, there are no sharp projections and it should brush past painlessly. Where possible the tyres are the first point of contact. The underside is smooth so if you do get run over, it is as painless as possible. This feature also means that if you meet bumps and the vehicle bottoms, it behaves like a well designed sledge. Obviously the side with only one wheel is more prone to tipping. The chassis is rounded to ensure that when it does touch ground it doesn’t dig in but again behaves like a well designed sledge. Correctly set up, it is remarkably difficult to dig in the back end. I assure you I have tried. Roll cage. I deliberately haven’t fitted one because I haven’t yet found a need for it. I need to be able to roll it first. I can fit one, but I don’t want there to be a disabled model, identifiable by the roll cage. I may build an idiot’s model, identified by the roll cage if I can get the iBex to flip over, and I may offer a roof option to keep the sun/rain off which will double as a roll cage. Or I may simply find a way of incorporating a roll cage into a styling exercise, so everyone wants that version. If it was a requirement, fitting a roll cage is no problem. It may also be an aid to getting a wheelchair in and out of thee iBex for those like Sarah Piercey who are significantly faster in their wheelchairs than I am on my legs. The above section is no longer true. I have two roll cage variants designed for John Bunce who wants to take the iBex into woodland, towing a logging rig and extracting timber. This makes it possible to flip any vehicle if the horse pulling, the iBex and the timber hitch aren’t in a straight line when serious effort is used. Actually the roll cage is far more use as a frame for John to move himself in his seat and adjust his position. Lights. The legal requirements for horse drawn vehicle lighting suggest lighting the candle and blowing it out before you set off as candles are easier to relight than to light first time. I do not consider this a safe approach. I don’t even fit the obligatory reflectors on my vehicles because that would imply I thought my vehicles were safe on the roads. I don’t. I don’t consider the roads a safe environment for animals. If you want to judge the safety of a road for animals, count the bodies of dead animals along the stretch you intend to drive. Three cars overtook illegally as I drove over this zebra crossing. Horse drawn vehicles are perfectly legal on UK roads, except Motorways and I do most of my normal day to day testing on them. They just aren’t safe, and I can’t make them safe. Lights can not be too strong, or too bright. Make them flash, do anything you can to attract the driver’s attention. Personally I advocate a Kalashnikov. Nothing else really works. 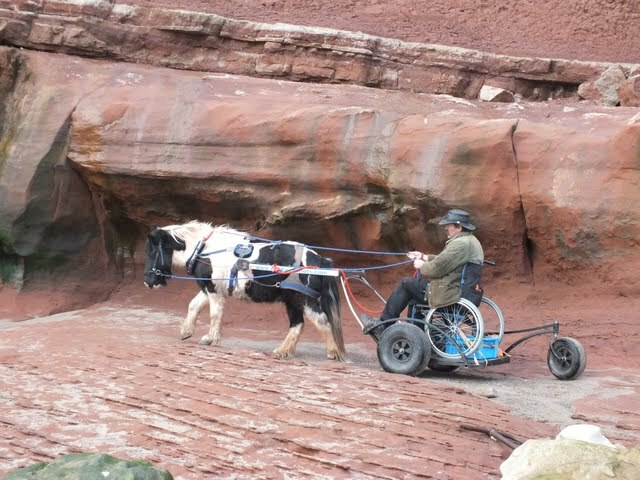 I have driven the early prototype iBex from Exeter to Hyde Park and driven round Hyde Park on my own in a wheelchair. The journey took 16 days on the road. I know what the roads are like. Avoid them like the plague. Selection of horses and training. In almost any Risk Assessment horses are described as large, heavy animals. Large means they can push you around and heavy means when they tread on you, it does serious damage. Ponies are like horses but smaller and lighter, therefore by definition safer. They are on a level to relate to wheelchair users yet have the power to take large adults frighteningly fast. 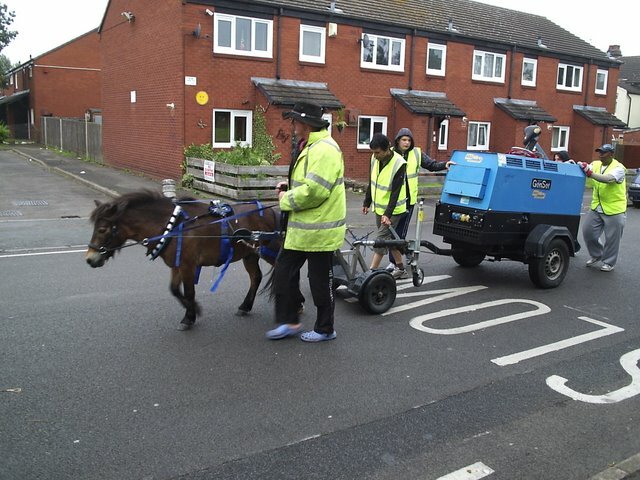 (With the iBex instant release, letting go if it all gets scary is an option) My 1 metre pony, Henry, pulled a 970kg generator through Birmingham for the sound system at the Balsall Heath Carnival . Not my choice, but it was that or manhandle the thing nearly a mile. So Henry’s vote didn’t count. 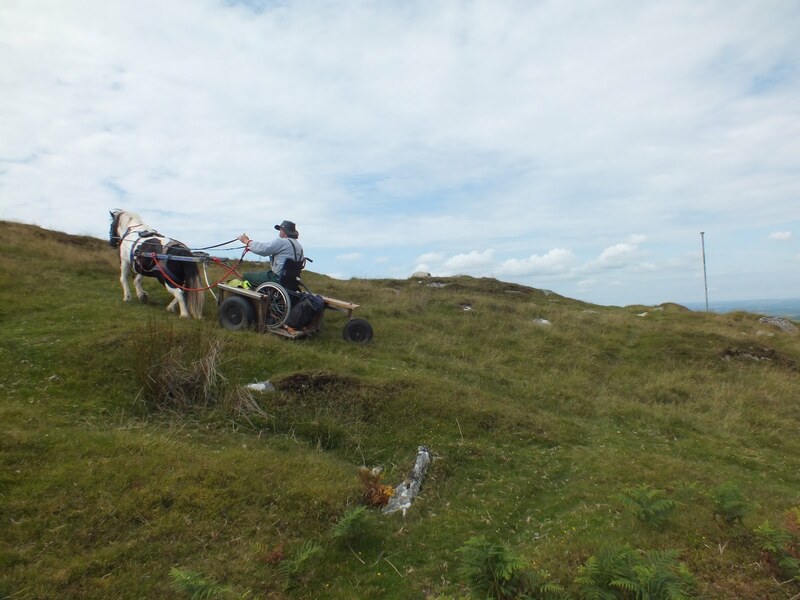 Dartmoor ponies have pulled stuff around Devon for farmers for centuries. With the advent of tractors and quad bikes they have nothing to do, and are being shot and fed to zoo animals. The iBex gives them a serious use. This isn’t about rescuing them, this is about giving them a new long term future and providing all terrain access to people who have been denied it. The iBex was designed using cowardice as a design tool. I welcome risk assessment. I want pony activities to be as safe for beginners as learning to ride a bike under proper supervision. The iBex makes this level of safety possible,,because at any stage the risk aka the pony, can be removed. That is safety. 2 Responses to Risk Assessment.